Work-Life Balance – Is it Affecting You? Work–life balance is defined as proper prioritizing and balance between work career, achievement and ambition, lifestyle, health, pleasure, leisure, family and enjoyment. Due to enhanced competition, hard work and striving to be the best has become a perceived necessity for ‘success’. This has reduced the number of tasks and activities people engage in just for enjoyment or fun. There is an enormous pressure to excel at everything and to continuously think in terms of achievement. According to Ma Foi Randstad Workmonitor Survey 2012 Wave 1, there is a definite challenge for employees in India in handling work-life balance. . “Technology has increased work efficiency to a large extent, but the downside is that it has also simultaneously created a 24/7 intrusion in the private lives of employees,” Ma Foi Randstad MD and CEO E Balaji said. Moreover, 79 per cent of employees said that they receive work-related phone calls/e-mail while on holiday and similar proportion (80 per cent) said they receive work-related phone calls/e-mails after office hours. The significance and implications of such HR interventions are many. Research findings suggest that Work Life Balance Programs (WLBPs) not only help employees better manage their work and family roles (Thomas & Ganster, 1995), but also affect employee attitude and behaviors such as organisational commitment (Grover & Crooker, 1995), job satisfaction (Kossek & Ozeki, 1998) and intention to quit (Lobel & Kossek, 1996). It is however very important to establish that maintaining healthy work and personal life balance is not only the responsibility of employers and HR staff. Employees themselves have a major role in the work culture and stress patterns they establish for themselves in the lives. As Bowswell and Olson-Buchanan stated, “increasingly sophisticated and affordable technologies have made it more feasible for employees to keep contact with work.” Researchers have found that employees who consider their work roles to be an important component of their identities will be more likely to apply these communication technologies to work while in their non-work domain. Also proper time management, prioritising and assertiveness are skills that go a long way in ensuring higher probability of work life balance. Consider all the things that compete for your time, and prioritise. Learn how to say no. Assertiveness plays a major role in helping establish health working patterns with seniors and colleagues. Prioritise the importance of a task. It is important to consider the time you have in hand while making delivery commitments. You also can consider saying no when certain requests or orders are beyond work hours or capacity. If your firm allows staffers to telecommute, consider working from home a few days a week. When discussing this option with your boss, approach it from a position of strength. Describe how the flexibility could ultimately help your company. Technology is a good servant, but a bad master. Remember that BlackBerrys, iPhones and other devices exist to make your life easier, not to rule it. Remember not all activities have to be about achievement and excelling. While out of work trying doing activities like exercise reading yoga etc. that don’t have relations with work performance. Make sure to understand the importance of rest and play in enhanced performance. A few years ago, on a trip to Pennsylvania, I stumbled across Fort Necessity National Battlefield where a brash lieutenant colonel once lost a battle that helped start the French-Indian War. Young George had picked a fight while scouting the Ohio Valley and paid the price, ultimately in surrendering this colonial outpost. It wouldn’t be his last battle lost, but as historian Alan Axelrod captured, the Blooding at Great Meadows would indeed be the battle that shaped the man. The experiences George Washington gathered and how he effectively managed his career transitions to become the Father of Our Country are not unlike the transitions through which leaders from all time and contexts go. For centuries, pages became squires and squires became knights, with each transition carrying its own unique elements. Still today, at each progressive career stage, leaders must develop new skills because those they’ve mastered are no longer sufficient to be successful in their new roles (read The First 90 Days by Michael Watkins and What Got You Here Won’t Get You There by Marshall Goldsmith). Understanding this phenomenon and working to manage transitions is one of the hardest things leaders do along their journey. Check out the original article : From Contributor to Leader: A CEO’s Advice on Successfully Navigating Critical Transitions | Leadership | Training Industry. Time Mastery and Relationship Mastery are essentially the most important skills for effective leaders according to Tony Robbins. Focusing your energies in the right direction towards targeted results and ‘cutting through the clutter’ is essential. In this process, building of deeper relationships on a personal level would prove beneficial in the long run. Leaders have the quality of emotional mastery, which gives you the strength and flexibility to tackle any challenge, even when all hell is breaking loose, as we covered in the previous blog post in this series. 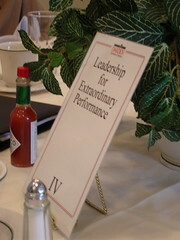 Now we’ll look at two other core qualities extraordinary leaders possess, RELATIONSHIP MASTERY and TIME MASTERY. Ultimately the quality of your life is the quality of your relationships. How many times have you heard, “business is relationship?” It’s one of those clichés that never escapes us. But one reason we hear clichés again and again is because they are true. Ultimately our capacity to connect, not on a surface level, but on a very deep and personal level, is what allows us to break through the limitations that stop ourselves or any individual or group we are looking to lead to a new level. Relationships are built not just by practicing rapport skills, but by truly understanding and appreciating where people are coming from—wanting to step in their shoes, understanding their point of view and finding a way to help them meet their needs while they meet the needs of the team and the organization. Facebook and Twitter are great tools, but if your idea of friendship is your Facebook or Twitter circles, perhaps it’s time to look deeper. Check out the original article : Leadership Secret Three: Two Skills Great Leaders Master | LinkedIn. What if I told you the Self Esteem is a Myth? Self-esteem is probably the greatest emotional disturbance known to the human race, if we understand self-esteem in the way in which it is usually defined. Albert Ellis: founder of Rational Emotive behavior therapy and one of the most influential people in Psychology in the 20th century according to American Psychology Association, discusses the concept of self esteem and has a rather radical view on what the commonly held belief and perception of Self Esteem is. In his book the Myth of Self Esteem he discuss the philosophy and view of self worth and self esteem by various renowned religious teachers, philosophers, and psychologists, including Lao Tsu, Jesus, Spinoza, Nietzsche, Kierkegaard, Buber, Heidegger, Sartre, Tillich, DT Suzuki, the Dalai Lama, Carl Rogers, and Nathaniel Branden, among others. What exactly is self-esteem? Most people, as well as many psychologists and educators, believe we need it, that it’s good for our emotional well-being, and that it makes us more successful. There are tons of self help books and inspirational speakers that give solutions to low self esteem, increasing self esteem etc. but really is estimating self logically accurate?. I would disagree. World-renowned psychologist Albert Ellis says,” It’s all a myth”. Human beings cannot legitimately be given a single global rating. When human beings say that I have high self esteem or low self esteem it usually involves the person giving himself or herself a single global rating. Indeed, the concept of self-esteem frequently advocated by the majority of counselors and psychotherapists is based on this same principle. Low self-esteem involves the assignment of a single negative global rating to a person, and high self-esteem involves the assignment of a single positive global rating to the person. Albert Ellis after researching and contemplating on views of various philosophers and great thinkers argues that it is not possible to give a person a single global rating whether negative or positive. This is best shown if we define clearly the terms self and esteem. First, let’s take the term self. Paul Hauck (1991) has provided a very simple but profound definition of the self. He says that the self is “every conceivable thing about you that can be rated” .This means that all your thoughts, feelings, behaviors, belief systems, achievements and bodily parts are part of your self,. Everything that belongs to you from the beginning of your life to the moment just before your death has to be included in your self. Now let’s consider the term esteem. This term is derived from the verb to estimate, which means to give something a rating, value or estimation. The question then arises: Can we give the self a single legitimate rating, estimation, or value that completely accounts for its complexity? The answer is clearly no. As Hauck notes, it is possible to rate different aspects of one’s self, but a person is far too complex to warrant a single legitimate global rating. To give a person a single global rating-one would need to create a tool so powerful that it could analyze the millions upon millions of data produced by that person. and logically it would become immediately redundant since we are constantly changing and produce new data . Therefore as mentioned in his book Practisce of Rational Emotive Behavior Theraphy ,Ellis quotes ” A person is an ongoing, ever-changing process and thus defies the ascription of a single static global judgment” (Ellis & Harper, 1994c, 1996a; Ellis & Harper, 1961a, 1997). In addition to give a universal single rating one would have to average out the rating of various aspects of self, which would be equivalent to averaging out 2 bananas 14 apples and 3 Mercedes Benz Cars. To summarize, it is not possible, in any legitimate sense, to give one’s self a single global rating because (a) you are too complex to merit such an evaluation and (b) you are an ongoing ever-changing process that defies being statically rated. Self-esteem results in each of us praising ourselves when what we do is approved by others however, we also damn ourselves when we don’t do well enough and others disapprove of us. What we need more than self-esteem, Ellis maintains, is self-acceptance! It is justified to rate ourselves on certain aspects or have a comparative view of aspects of self to that of others. This would be essential for growth and development of skills and potential. However one must refrain from universally downing or praising self on the basis of performance or achievements in individual areas. It is important to understand that my performance is not me. It is an aspect of me and if I sing poorly or am a bad public speaker for e.g. it would only mean that I sing poorly or speak poorly and would have nothing to do with self esteem or self worth. Ellis, Albert (2005). The Myth of Self-Esteem. New York: Prometheus books. Ellis, A., & Dryden, W. (2007). The practice of rational emotive behavior therapy (2nd ed.). New York: Springer. Decision Making: Are You an Autopilot? According to a survey by Columbia University decision making researcher, Sheena Iyengar, the average American makes approximately 70 conscious decisions every day. One must keep in mind that most decisions are made unconsciously. Jim Nightingale, author of Think Smart-Act Smart, states, “we simply decide without thinking much about the decision process“. In a controlled environment, such as a classroom, instructors encourage participants to consciously and proactively weigh pros and cons before making a decision. However in the real world, most of our decisions are made unconsciously or on “autopilot mode” as I would like to call it because frankly, it would take too much time to sit down and list the pros and cons of each decision we must make on a daily basis. What do I mean by autopilot mode? Let’s take an example of driving- when we are amateurs we are consciously aware of our actions while driving. Manoeuvrings, brakes, shifting gears- these are all done with full awareness. However when you become an expert, you don’t spend time in thinking about his next move. It flows seemingly automatically. Through experience we are aware of what action is required for every specific scenario. A pattern is formed and is followed. Similarly a pattern of thinking and decision making is formed over life and one uses these set frameworks to make decision. In order to make better decisions it thus makes sense that we identify these set patterns of decision making and also establish new efficient pattern. Intuitions, or gut feelings, are sudden, strong judgments whose origin we can’t immediately explain. Although they seem to emerge from an obscure inner force, they actually begin with a perception of something outside—a facial expression, a tone of voice, a visual inconsistency so fleeting that you’re not even aware you noticed. This is rapid cognition or condensed reasoning that takes advantage of the brain’s built-in shortcuts. Think of intuition as an unconscious associative process. Long dismissed as beneath the dignity of science, intuition turns out to muster some fancy and fast mental operations. The best explanation psychologists now offer is that intuition is a mental matching game. We choose actions and form opinions via mental processes which are influenced by an entire gamut of past information stored in memory. Keep the goal clear and in focus always.